I've never been an Evernote user, but I know many lawyers who love the service. The company increased its prices this week, which as you can imagine was unpopular with many users. Both Florida attorney Katie Floyd and California attorney David Sparks discuss the new prices. Law Technology Today interviews a panel of lawyers to discuss finding a work life balance through technology. Brett Burney reviews LawStack, an app that contains rules and statutes. 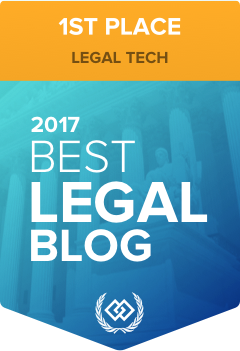 San Francisco lawyer Casey Sullivan discusses a survey of New York judges regarding the use of technology in an article for the Technologist blog. Long after the rest of the world moved on to iPhones and Android, many in government in D.C. continued to use Blackberry devices. Jim Swift of Bomble.com reports that Senate staffers received notice this week that they will no longer be issued Blackberry smartphones. Oscar Raymundo of Macworld describes a few of the smaller, but useful, features of iOS 10 (coming this Fall). Serenity Caldwell of iMore describes some of the most underrated features in watchOS 3 (coming this Fall). John Brownlee wrote an interesting article on how Apple brought Apple Watch fitness features to wheelchair users in an article for Fast Company. I've seen some very favorable reviews of the new Bose QC35 noise-cancelling wireless headphones. For example, Serenity Caldwell of iMore says in her review that it is on the short list of her favorite tech purchases of 2016. Dan Moren of Six Colors discusses Philips Hue bulbs, and also HomeKit accessories in general. J.R. Bookwalter of Macworld reviews Streets, an app that integrates Google Street View with Apple Maps — and even brings Street View to the Apple Watch. Zac Hall of 9to5Mac reports that the Walgreens app now has better integration of coupons. This reminds me that I should use the app more. There is a Walgreens close to my house, and I love that it is so easy at that store to use Apple Pay and to even enter my Walgreens reward card using my iPhone and Apple Watch. As reported by Jared Nelson of TouchArcade, the iPad game Lego Star Wars: The Force Awakens was released this week. My son and daughter give it two big thumbs up, and after watching them play the game a little, I may have install it on my iPad too to give it a spin.